Welcome to the Easter Egg guide for Ancient Evil, the DLC 2 zombies map for Black Ops 4. This guide contains step by step instructions for completing the main EE along with screenshots, puzzles solutions and maps where appropriate. Ancient Evil is the second DLC zombies map in Black Ops 4 that continues the story of the Chaos crew as they enter ancient Greece and the city of Delphi. Among other things, the map introduces a friendly flying horse (Pegasus), four elemental gauntlet wonder weapons, skeleton zombies and a final BOSS zombie to finish things off. The maps main wonder weapon is a gauntlet that can be upgraded into four forms, and all four gauntlets are essential for completing the EE. The Hand of Gaia is one such example of an upgraded wonder weapon, for which a trophy called "Move Mountains" is achieved by impaling 8 zombies. There are three other elemental versions including the Hand of Charon, Hand of Hemera and Hand of Ouranos, for which there are also related trophies: No Obol, Too Close to the Sun and A Mighty Wind. Sadly, given the current state of the zombies community Black Ops 4 is currently low on player numbers and it's likely that this EE hunt will suffer from a lack of community support. Therefore, expect a slow hunt. As always I will endeavor to keep this guide updated with the latest steps, corrections and anything important along the way. Please feel free to catch me on Twitter or leave comments below that you think will help others. 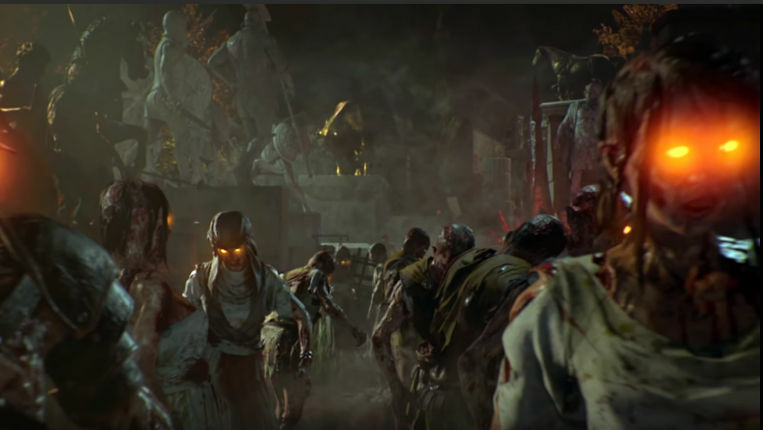 Update: Now that the EE is complete, it was a pleasure to see the community rally around Treyarch zombies once again. The hunt was perfect, no leaks, just pure exploration and teamwork. Exactly how it should be. Is this EE possible SOLO? - YES, I can confirm that this EE is entirely possible SOLO. Although some steps require more than one player, the game will spawn in a bot to help you when required. In Ancient Evil, finish what was started. Successfully completing the EE will unlock the final cutscene and possibly the permanent end of the Chaos storyline (given its popularity). Ancient Evil introduces a brand new perk to the zombies series. With a bright purple background, the perk depicts a falling body with a shattered head and bright shock coming from the chest. Fans speculated that this perk would either cause headshots from regular body shots or collateral damage to nearby zombies following regular hits. It turns out that the official perk is actually multifunctional, it has a chance to make the zombies head explode or cause a gas that you can stand in to apply a zombie blood style effect. As before, players can customize the perk they want to appear at each statue before entering a match. The artifact is located in the above ground area of the Delphi city. You will have to leave the Apollo Temple and open several doors to get to the circular arena area called the Amphitheater. Once inside the Amphitheater, look for the female statue that has a missing head and a king statue standing behind it. The artifact is dangling from the arm. Interact with the artifact to start a lock-down challenge where you fight off the zombies. Once complete, claim the artifact for yourself. The first step to acquiring the Pegasus Strike weapon is to first activate Pegasus. You must have competed the challenge in the Amphitheater to get the artifact before attempting this. Get the Golden Bridle - located in one of the following locations: Pedestal in Intersection of Treasuries, or Pedestal in the Stoa of the Athenians. Get the Anvil part from the Cliff Ruins. Get the Hammer part from Python Pass. Get the Prongs part from River of Sorrow. Go to the forge room in the Cliff Ruins, craft the Pegasus Strike at the crafting station. Alternatively, you can get the Pegasus Strike from the mystery box. Find the Eagle stuck inside a large suspended cage in Python Pass - drop the cage by shooting it with a weapon, then free the eagle using your specialist weapon. This spawns a Gegenees (mini-boss). Go to Cliff Ruins, free the second eagle from the cage using your specialist weapon. Go to the Center of the World, wait until the Eagles have opened Pack-a-Punch. In all cases you must first obtain a Dormant Hand which you later transform into the actual wonder weapon. The oracle lady (announcer) gives you cryptic audio clues to the hands location. To get a Dormant Hand, look for a vase or dig site with purple gas surrounding it, smash it with a melee attack and pick up the hand. Stoa of the Athenians - on bench. Stoa of the Athenians - right side of boat. Intersection of Treasuries - near the sword. Spartan Monument - pile of rocks behind statue. Spartan Monument - next to pillar and fire pot. Center of the World - near PaP and the trap. Center of the World - dig pile on the floor. Cliff Ruins - near the birdcage. Hand of Charon - Go to the Python Pass via Pegasus, place hand in Charon altar. Hand of Ouranos - Go to the Center of the World via Pegasus, place hand in Ouranos altar. Hand of Hemera - Go to the Hemera altar in the Monument of Craterus. Hand of Gaia - Go to the Spartan Monument and place hand in the Gaia altar. Repeat the steps above to build ALL of the hand Wonder Weapons before moving on. Simply kill zombies using the Hand of Charon in the River of Sorrows. when ready, drink water from the River of Sorrows and the screen turns red and you will not regenerate health anymore. While in this mode, find the "real" coins scattered around the Underworld and avoid the fake ones. Once you collect three real coins return to the Charon altar and complete the upgrade. A blue feather will float down if done correctly. Collect three feathers, return to the Ouranos altar in Center of the World and interact. Enter the portal and complete the challenge to collect the upgrade. Go to Upper Road and look for the three golden plates/shields. The image above shows one particular shield that's perched on top of the bridge. Shoot the shields to rotate them correctly, then shoot a shield with the WW to reflect the blast off the shield and into a nearby bowl. When all three light the bowl then melee the bowl and return to the altar and access the portal as usual. After shooting a red plant several times, a Seedling (Child of Gaia) will drop. Pick up three of these and return to the shrine of Gaia in the Spartan Monument area. Place the seedlings, enter the portal and complete the challenge to claim the Redeemed version. Shield piece obtained by killing a Gegenees (mini-boss). To force a Gegenees to spawn, obtain the Golden Bridle required to activate Pegasus. Apollo's Will can be built at the crafting table in the Marketplace, beside the 9mm wallbuy. The first official step of the Easter Egg and a fairly simple one at that. Complete enough Tributes (mini-challenges for the Oracle) in the Temple of Apollo until a blue fire pit appears. For four players this can take at least 5+ Tributes. Use your shield/spear to gain a blue flame on your spear by meleeing the flame. Next, don't change weapons, find the three oil stains around the map which are clearly visible thanks to their rainbow colours. Some are on walls, beside plants and in tight corners. Using the shield/spear, ignite the oil which then ignites a beacon. Intersection of Treasuries - on wall, beside red tent. Upper Road - leading up the stairs, on the rock between statues. Spartan Monument - on the wall, by the statue. Go to the Spartan Monument and look for the row of statues as shown in image above. Have the player with the Hand of Charon stand in front of the row of statues and shoot the blood projectile on the floor. A "filter" effect will apply to their screen. Have this player kill zombies and then look for the statue with blue eyes and shoot it with a charged shot. It should explode into pieces. Repeat this process: continue to kill zombies, look for the blue eyed statue, shoot it. Each of the statues will disappear one by one. Once all of the statues are gone, the quest objective changes to Align the Citizens. The task now is to use your spear to activate the cogs. Cogs are hidden behind walls which can be destroyed with PaP'd weapons. Once you find a cog, jam a spear into the small cog when it's aligned with the larger cog. If done correctly, the nearby statue starts spinning. Tip: Look for bricks with a faint blue glow of light passing through them. Intersection of Treasuries - side wall of the tomb building (rear side of building with red tent). Spartan Monument - wall near the statue with a spear. Intersection of Treasuries - left of Auger wall buy, the house outside of the map. Once all three statues are spinning, throw a flaming spear past the pillar (with the crystal on top) in the middle of all three statues. Make sure you hit the large cog in the temple room behind. The best place to throw is from Stoa of the Athenians. If done correctly the crystal pillar raises and the light beams all intersect. Go to the Intersection of Treasuries and look for the object inside the large red crystal (shown in image above). Tempt a Gegenee (mini-boss) to use his shield blast to free the object and then pick it up. Return the object to the Ra statue in the Gymnasium Bathhouse. Tip: It might be worth doing the vines step below first if you need a Gegenee to spawn. Next, go to the Offering of the Attalids and shoot the black "vine" shape on the wall behind the statue using the Redeemed Gaia. See image above to understand what this vine shape actually looks like. The important point is to stand on the right of the temple, facing the statue, so that two vines are visible at once. The Gaia shot will split into two, hitting both simultaneously. Find the next vines quickly, they're nearby so stand on the left of the temple, looking slightly up at the temple roof. They should flash to give you a clue. This time you need three vines in sight. Shoot and the shot splits into three. Eventually after shooting enough of these black shapes, a Gegenee (mini-boss) will spawn in with a pole. Kill him, claim the pole object and place it in the other hand of the statue in the Gymnasium Bathhouse. Finally, return to the Offering of Attalids where the giant sun dial is on the floor. Place the pole in the middle of the sun dial. Now kill an electric zombie on the sun dial to light up the first blue symbol. Now kill another electric zombie on the dial and this time watch as another dial rotates with orange and blue symbols. The trick is to stop the rotating symbol (by interacting with it i.e press square) when the blue symbol would be next to the other blue symbol. You won't see this because it's underground, but count the rotations and make a good judgement. Do this successfully twice to line up three blue symbols on the dial. If you fail, the screen flashes and you must try again. Finally, interact with the Ra statue once again to give him the Hemera gauntlet (Light Hand). Ra will shoot a bright beam onto a wall opposite him. Now defend the beam of light from attacking skeleton zombies for about 45 seconds. The wall lights up with a sun symbol before it's destroyed, revealing a secret room. Pick up the Scepter from the room and interact with the Ra statue once more and the beam directs into the water pool before a massive pillar ascends upwards. The quest objective changes to Hit Your Marks. Have all players return to the Amphitheater. Take note of the four coloured symbols on the floor, each one corresponding to a particular wonder weapon. Depending on the number of players, have all players stand on a colour that matches their gauntlet. Wait for the challenge to start, one or more new colours appears on the ground. The players with the matching colours must stand in the new circles, it will stick to their feet, and now kill zombies using their gauntlet wonder weapon. The challenge rotates between colours. Repeat this process several times. Go to the River of Sorrow and locate the door next to the Spitfire wall buy. 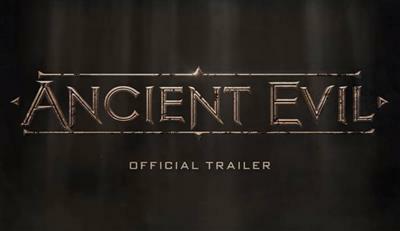 Enter the symbols on the door so they glow blue, in the order shown in the Ancient Evil trailer. The image above shows which symbols need to be hit, the sequence is shown below. Finally, get Shaw to stand in front of the door to trigger the cutscene. Next, head up the stairs at the River of Sorrow and place down the Pegasus Strike on the blue glowing symbol on the stairwell. Pegasus will now cause a giant Ballista (Crossbow) to spawn at the bottom of the stairs. Align the Ballista (crossbow) by charge shooting it several times, from several angles with the Redeemed Hand of Ouranos (Wind gauntlet). It's not clear exactly which angles but shoot it from downstairs and aim for the cog underneath the crossbow. When aligned, the crossbow points upwards directly at the Python. Next, light your spear from the blue flame bowl in the Apollo Temple (by meleeing it while spear is armed), this should turn the spear blue. Head down to the poison trap in Center of the World / Python Pass and light your spear green by turning on the trap and running through it. Now return to the crossbow and melee it to fire a green bow. If done successfully, the announcer will say that an entrance to Mount Olympus is open. Now head towards the Center of the World and take the portal to the boss fight. After being teleported to Mount Olympus a short cutscene plays before the BOSS fight begins. Players start in the Fountain area but can travel between the Columns and the Forest also. An evil Pegasus has spawned in for the BOSS fight so concentrate on killing this using your Wonder Weapons. After Pegasus is taken care of, the giant soldier BOSS makes an appearance, armed with a shield and sword. Unleash everything you've got at this final BOSS and once killed the main EE is complete. Congratulations, you have completed the final EE for the Chaos crew in Black Ops 4 zombies. The ending cutscene plays - enjoy it, you've earned it! The EE hunt is now complete! This guide will be updated with any corrections and enhancements in the coming days. Thank you for following and supporting this Easter Egg guide and I will see you again for the reunion of Richtofen and the Aether crew in DLC 3!